Photograph, Picture of the sign for Lyndon B. Johnson Space Center. Image available on the Internet and included in accordance with Title 17 U.S.C. Section 107. Photograph, Picture of the front of Lyndon B. Johnson Space Center. Image available on the Internet and included in accordance with Title 17 U.S.C. Section 107. 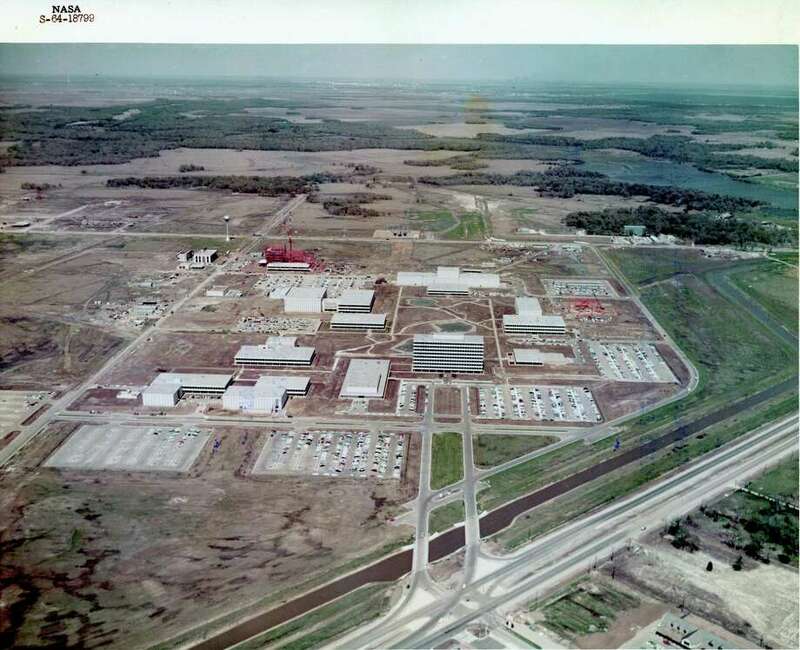 Photograph, Aerial view of the Lyndon B. Johnson Space Center. Courtesy of NASA. Image available on the Internet and included in accordance with Title 17 U.S.C. Section 107. Logo for the National Aeronatuics and Space Administration, or NASA. Image available on the Internet and included in accordance with Title 17 U.S.C. Section 107. 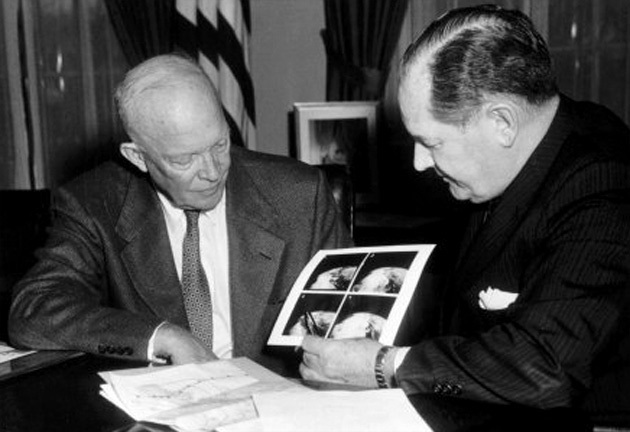 Photograph, Picture of Dwight D. Eisenhower learning of the latest news with NASA. Image available on the Internet and included in accordance with Title 17 U.S.C. Section 107. LYNDON B. JOHNSON SPACE CENTER. 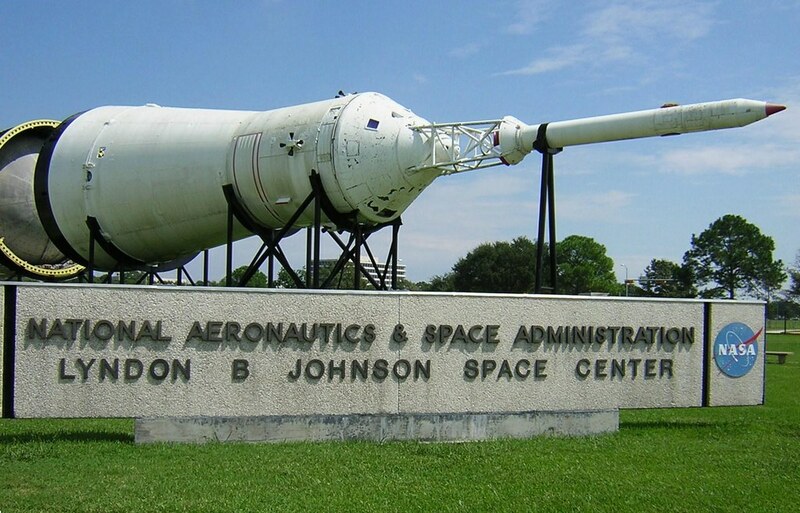 The Lyndon B. Johnson Space Center, originally known as the Manned Spacecraft Center, is one of ten National Aeronautics and Space Administration field centers and home base for the nation's astronauts. The origins of the center are to be found in the national commitment to a broad program of space exploration, including manned space flight, which the United States made in response to the Soviet Union's successful space launches, begun in 1957. 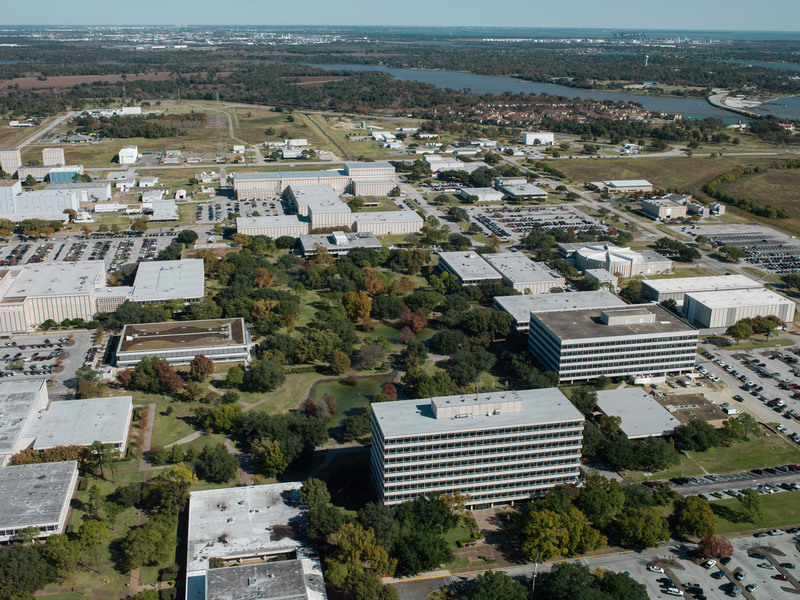 At its complex of more than 100 buildings on a 1,620-acre site twenty-five miles south of downtown Houston, the center houses its facilities for conducting space operations and applied research. In 2015 it employed more than 11,000 workers, including approximately 80 astronauts and about 3,000 federal workers, involved in the design, development and testing of spacecraft for manned space flights; the development and operation of permanently manned space stations; the selection and training of astronauts and other specialists; experimentation; medical research; and propulsion-systems testing at White Sands Test Facilities at Las Cruces, New Mexico. Center customers include NASA, the Department of Defense, and commercial organizations. From its inception through 2015, the center had received more than $150 billion in federal appropriations. In 2015 the center received approximately 25 percent of the total NASA budget and contributed nearly $3 billion to the Houston-area economy. On October 4, 1957, the U.S.S.R. orbited the first artificial earth satellite, Sputnik I. A month later, Sputnik II, weighing some 1,100 pounds and carrying a dog, went into orbit. These achievements, followed by the explosion at launch of this country's Vanguard rocket, which was designed to orbit a tiny research satellite, shocked the American public. Nine months of debate over national purposes, capabilities, and shortcomings produced the National Aeronautics and Space Act, signed into law by President Dwight D. Eisenhower on July 29, 1958. The act instituted a new federal agency, the National Aeronautics and Space Administration, which absorbed the pioneer National Advisory Committee for Aeronautics as well as space-allocated funds and several space projects from the Department of Defense. NASA was formed to be the focus of the nation's efforts in the space age. Photograph, Picture of the America's first astronauts, participants in Project Mercury. Courtesy of NASA. Image available on the Internet and included in accordance with Title 17 U.S.C. Section 107. Photograph, Project Mercury. Courtresy of NASA. Image available on the Internet and included in accordance with Title 17 U.S.C. Section 107. Photograph, Picture of President John F. Kennedy congratulating Alan B. Shepard Jr., first American in space, on May 5, 1961. Courtesy of NASA. Image available on the Internet and included in accordance with Title 17 U.S.C. Section 107. The most publicized aspect of NASA's variegated program was the drive to put a manned satellite into orbit around the earth. The undertaking, established in November 1958 and entitled Project Mercury, was managed by the Space Task Group, composed of former NACA scientists and engineers, with headquarters at NACA's Langley Aeronautical Laboratory, later renamed Langley Research Center, at Langley Air Force Base, Virginia. Project Mercury, proceeding under the assumption that the U.S.S.R. had man-in-space intentions, organized civilian, military, industrial, and academic resources to send a man into orbit and recover him. 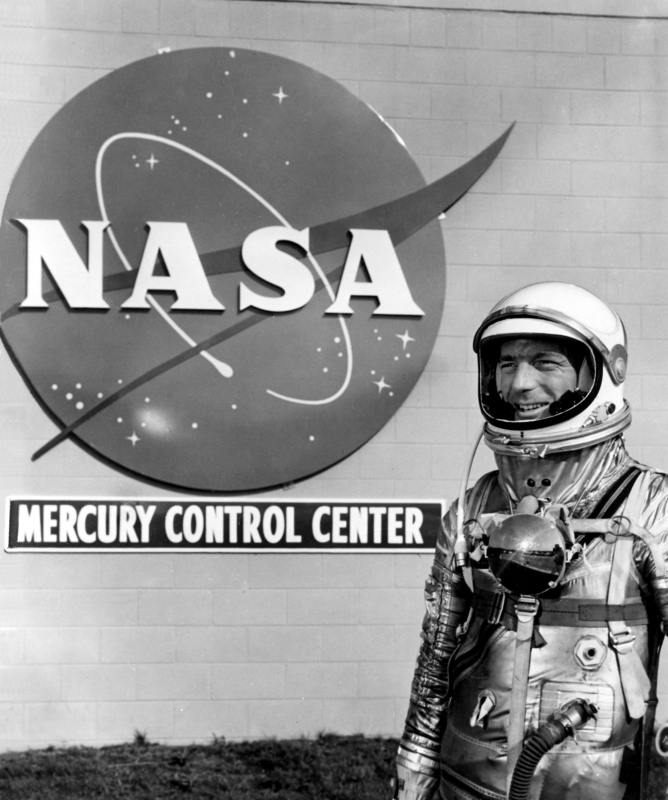 Between 1959 and 1961 Project Mercury, under the Space Task Group, trained seven military test pilots as "astronauts." 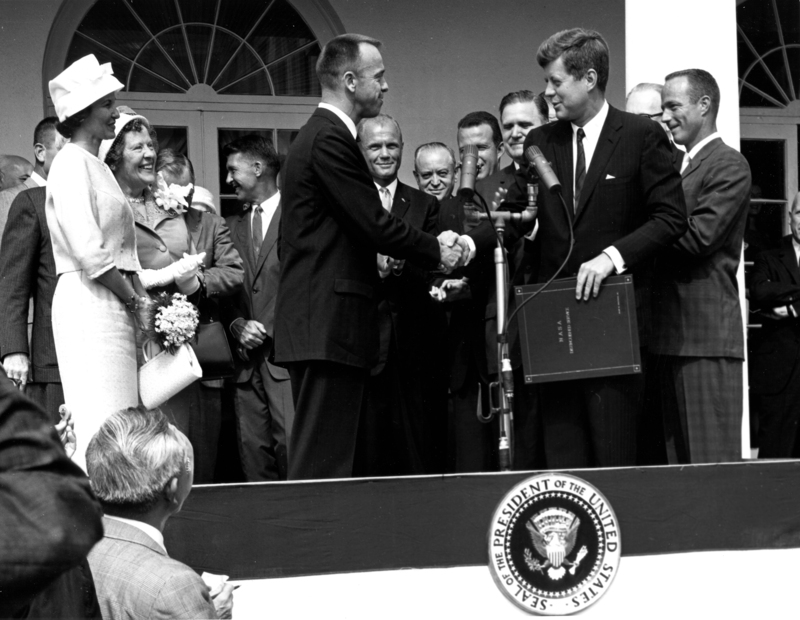 In May 1961, after the Soviets launched Yuri Gagarin into a one-orbit flight around earth, and after a Mercury space capsule carried Alan B. Shepard on a suborbital flight downrange from Florida into the Atlantic, President John F. Kennedy set as a national goal the achievement of a manned landing on the moon by the end of the decade. Photograph, Picture of the land set aside for Manned Spacecraft Center, later named Johnson Space Center, in Clear Lake, 1963. Courtesy of the Houston Chronicle. Image available on the Internet and included in accordance with Title 17 U.S.C. Section 107. 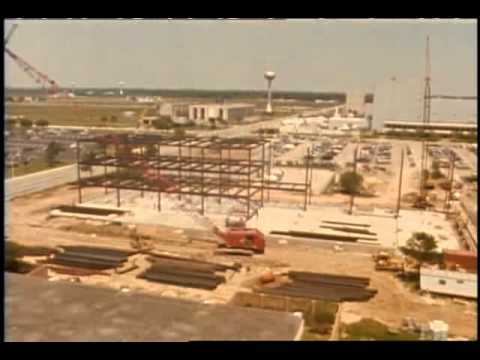 Photograph, Picture of construction beginning for Johnson Space Center. Image available on the Internet and included in accordance with Title 17 U.S.C. Section 107. Photograph, Picture of Lyndon B. Johnson, who helped start NASA and kick off the Space Race. Courtesy of NASA. Image available on the Internet and included in accordance with Title 17 U.S.C. Section 107. The extension of NASA's jurisdiction to the moon, and perhaps beyond, meant an enormous expansion of its research and development operations. NASA began to reorganize and increase its space establishments to carry to completion Project Mercury, to carry out Project Gemini (which had the mission of perfecting rendezvous and docking techniques essential to NASA's plans for lunar landing and return), and to carry out Project Apollo, the moonflight program itself. Central to the agency's new future was the construction of a manned-space-development aggregation, including the rocket launch facilities at Cape Canaveral (called Kennedy Space Center), Florida; the Marshall Space Flight Center, Huntsville, Alabama; a planned rocket assembly and test plant on the Pearl River in southeastern Mississippi; and a new space-management, crew-training, and flight-control center at a site to be selected. NASA formed a site survey team to investigate the qualifications of twenty prospective locations, from Florida to California. The NASA investigators evaluated each place by definite criteria: proximity of academic institutions with adequate research facilities; availability of water power and other utilities; temperate climate; adequate housing, land, and air and water transportation; and attractive cultural and recreational facilities. On September 19, 1961, Administrator James E. Webb of NASA formally announced that the new Manned Spacecraft Center would be built in southeastern Harris County, Texas, about twenty-five miles from downtown Houston, at the edge of Clear Lake, an inlet of Galveston Bay. Rice University was to transfer a 1,000-acre tract to the federal government for the construction of the center. Civic leaders and congressmen from other states doubted that Houston and environs met all of NASA's official criteria, at least any more than their towns did. They inquired about the roles of Vice President Lyndon B. Johnson, chairman of the high-level National Aeronautics and Space Council, and Representative Albert Thomas, also a Democrat and Texan and chairman of the Independent Offices Subcommittee of the House Appropriations Committee, in the choice of the Harris County site. Webb and other NASA officials denied all charges and suggestions of political influence, pointed to Houston's obvious attractiveness in relation to NASA's criteria, and added that the planned expansion of the Cape Canaveral launch facilities, the establishment of the Michoud Plant on the Pearl River, and proximity to the Marshall Space Flight Center in northern Alabama made the choice appropriate. MSC, Michoud, Marshall, and Cape Canaveral would be integrated into a space-engineering (development) as opposed to a science (research) enterprise. Photograph, Picture of Mission Control Center in Houston, TX. Image available on the Internet and included in accordance with Title 17 U.S.C. Section 107. 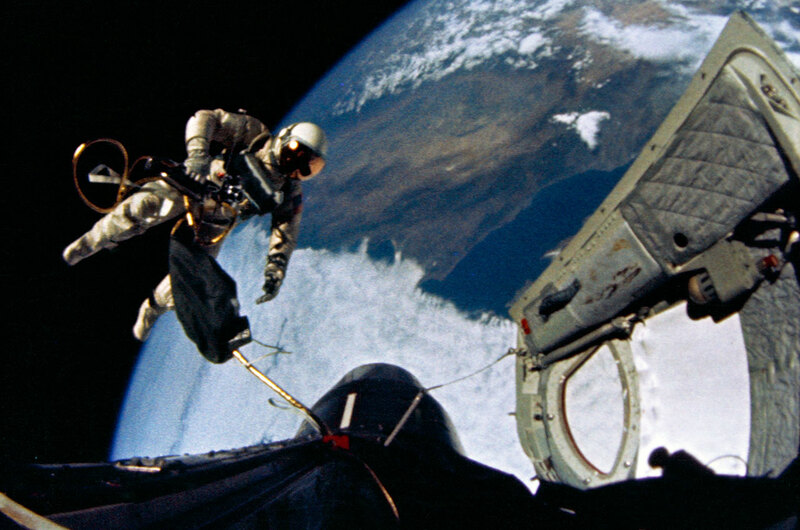 Photograph, Picture of Gemini 4 pilot Ed White during the first Ameircan EVA. Courtesy of NASA. Image available on the Internet and included in accordance with Title 17 U.S.C. Section 107. 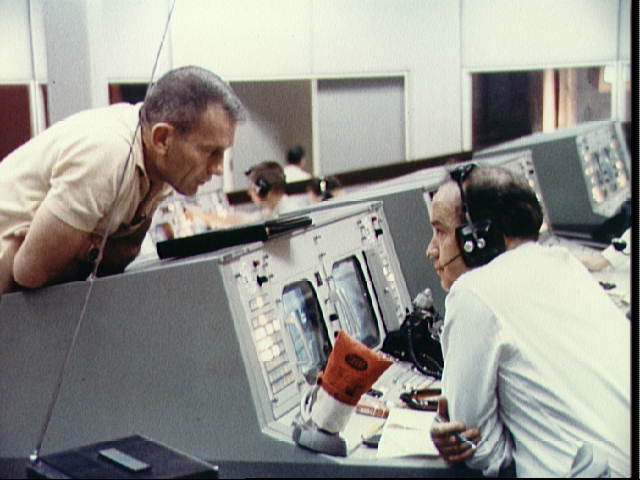 Photograph, Picture of MIssion Control Center during Gemini 4 flight. Image available on the Internet and included in accordance with Title 17 U.S.C. Section 107. 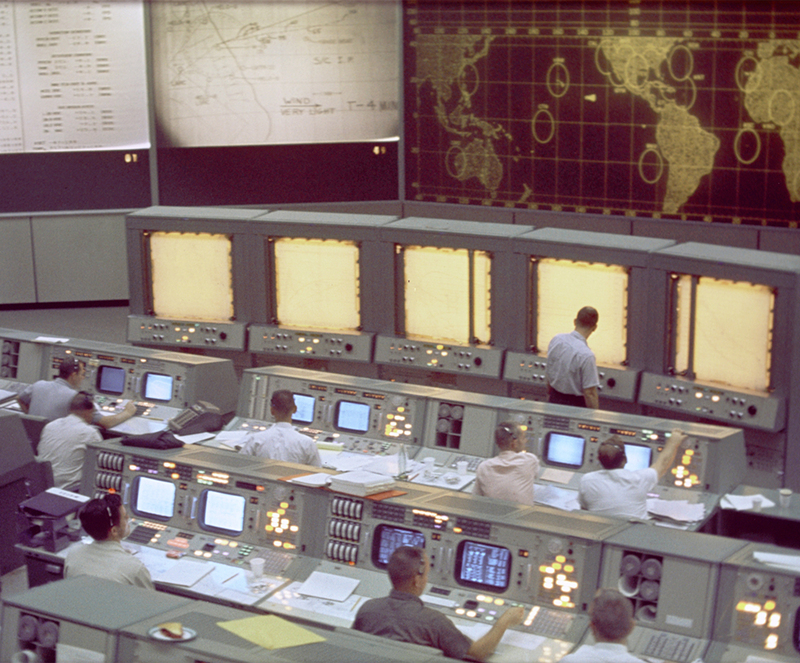 Photograph, Modern picture of Mission Control Center. Image available on the Internet and included in accordance with Title 17 U.S.C. Section 107. The United States Army Corps of Engineers then began construction at Clear Lake. The Space Task Group, redesignated the Manned Spacecraft Center, remained in Virginia pending its move into temporary offices in southeastern Houston. Thus it was from the Langley Research Center that John H. Glenn's three-orbit flight in February 1962 and M. Scott Carpenter's duplicate mission the following May were planned and effected. By the time Walter M. Schirra circumnavigated the earth six times in October 1962, the transfer of about 1,000 persons and direction of the Mercury, Gemini, and Apollo projects to Houston was essentially complete. Construction at Clear Lake continued on schedule, as Project Mercury ended after L. Gordon Cooper's twenty-two-orbit mission in May 1963. In September 1963 the Manned Spacecraft Center opened and assumed formal responsibilities as the Mission Control Center for human space flights beginning with Gemini 4 in June 1964. In October 1966 the MSC had a workforce of more than 5,000 housed in some fifteen functional structures located on 1,620 acres. Dominating the landscape was the nine-story project-management building, where the MSC hierarchy and many of the center's Gemini and Apollo engineering staffs had offices. Nearby were computer buildings, spacecraft-environment chambers, and astronaut-training facilities, including a large centrifuge. 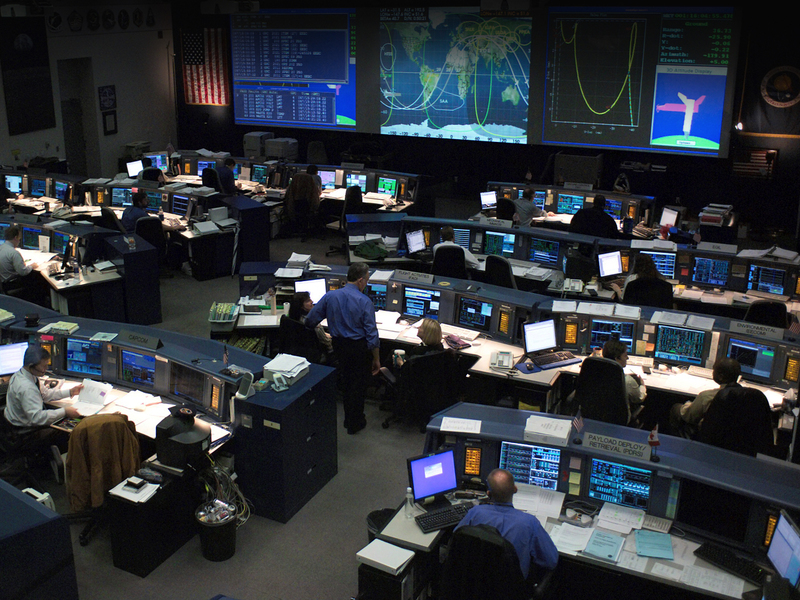 When flight missions are in progress, attention focuses on the Mission Control Center, where, once a spacecraft is launched, mission direction is assumed and maintained until the astronauts successfully reenter the earth's atmosphere. 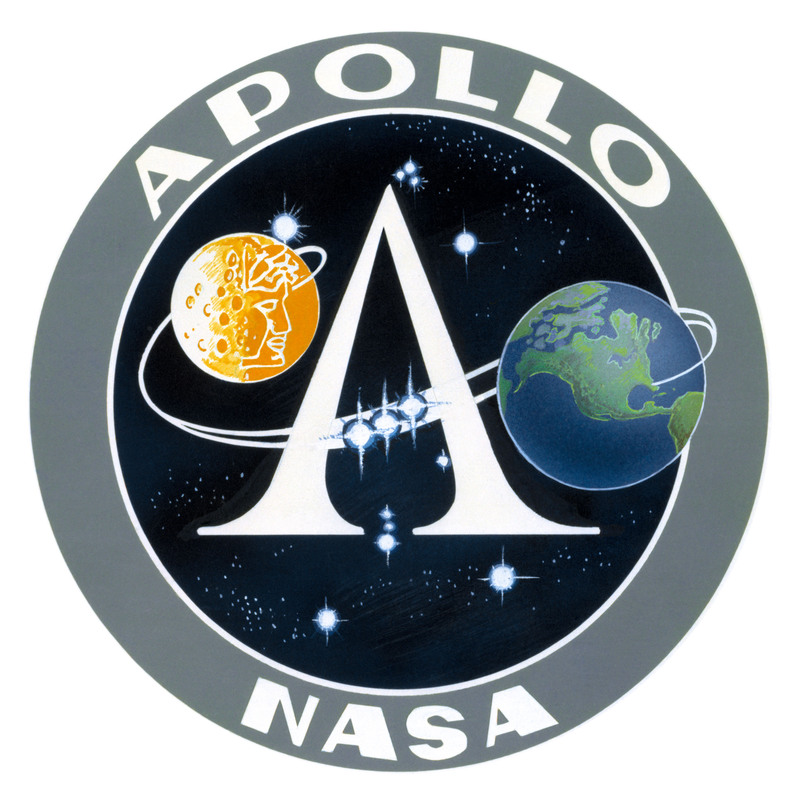 Mission Apollo project emblem. Coutesy of NASA. Image available on the Internet and included in accordance with Title 17 U.S.C. Section 107. Photograph, Picture of Apollo 8 mission heading toward the dark side of the moon. Image available on the Internet and included in accordance with Title 17 U.S.C. Section 107. 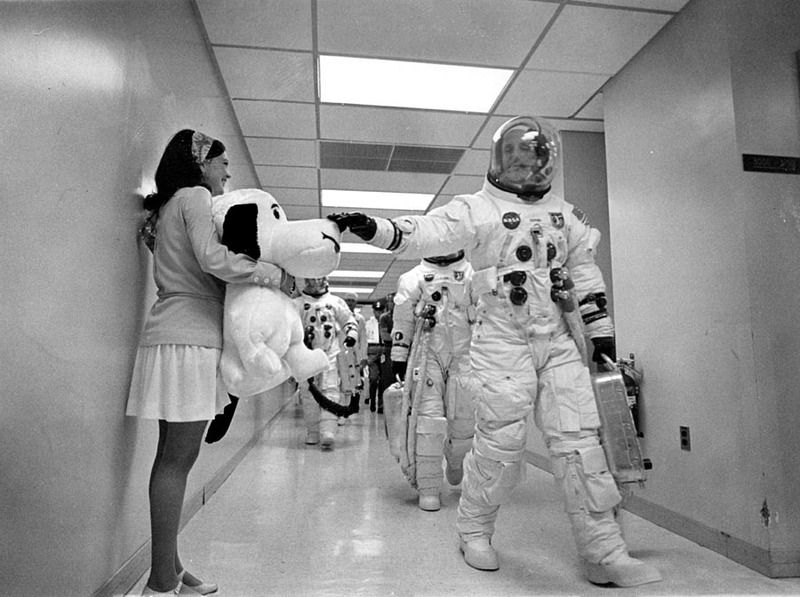 Photograph, Picture of Apollo 10 crew and mission commander Thomas P. Stafford patting the nose of Snoopy, the mission's mascot. Courtesy of NASA. Image available on the Internet and included in accordance with Title 17 U.S.C. Section 107. In preparation for an Apollo spacecraft to carry three astronauts to the surface of the moon, the Apollo 7 spacecraft was launched from Cape Kennedy, Florida, on October 12, 1968, and completed an eleven-day, three-man, 163-orbit mission. This was a successful test of the three-man spacecraft that had been modified after a fire killed three astronauts, Roger B. Chaffee, Virgil I. Grissom, and Edward H. White, on the launching pad at Cape Kennedy in January 1967. Soon after the successful Apollo 7 mission, Apollo 8, Apollo 9, and Apollo 10 were launched in final preparation for the projected lunar landing. These flights were all successful. Apollo 8 was launched in December 1968 with astronauts Frank Borman, William Anders, and James Lovell aboard. This was the first time human beings saw the hidden side of the moon and left the earth's orbital influence. The flight was significant in its successful moon orbit, preparatory to the moon-landing flight. Apollo 9 was the first mission to take the lunar-landing module into space. After launch on March 3, 1969, the three-man crew, James A. McDivitt, David R. Scott, and Russell L. Schweickart, spent approximately ten days in earth orbit testing docking maneuvers with the lunar-landing module that would be used in the moon mission. On May 19, 1969, Apollo 10, carrying astronauts Thomas P. Stafford, John Young, and Eugene Cernan, was launched into what NASA officials called a dress rehearsal for the moon landing. Landing sites on the moon were examined, the lunar module was tested in lunar orbit, and most of the maneuvers and checks necessary in the moon landing were rehearsed. Photograph, Picture of the moon landing. Image available on the Internet and included in accordance with Title 17 U.S.C. Section 107. Photograph, Picture of Mission Control Center celebrating the conclusion of the moon landing mission. Courtesy of NASA. Image available on the Internet and included in accordance with Title 17 U.S.C. Section 107. Photograph, Portrait of Alan L. Bean. Courtesy of Alchetron. Image available on the Internet and included in accordance with Title 17 U.S.C. Section 107. Front cover of the Daily News announcing the safe return of the Apollo 13 astronauts. Courtesy of the Daily News. Image available on the Internet and included in accordance with Title 17 U.S.C. Section 107. 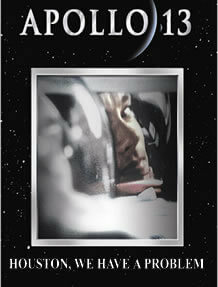 Movie poster for Apollo 13, with the tagline "Houston, we have a problem". Image available on the Internet and included in accordance with Title 17 U.S.C. Section 107. The objective of landing a man on the moon in the 1960s was realized when Apollo 11 was launched on July 16, 1969, with Neil A. Armstrong, Edwin E. Aldrin, Jr., and Michael Collins aboard. On July 20, 1969, Armstrong made his historic walk as the first man on the moon; Aldrin was the second. The moon walk received worldwide television coverage; some claimed that one out of every four people on earth witnessed some part of the Apollo 11 moon flight. The Apollo crew conducted various scientific experiments on the moon's surface and set up several instruments for continual relaying of information back to NASA installations on earth. The astronauts brought back samples of lunar material when they returned on July 24, 1969. The next flight to the moon, Apollo 12, was struck by lightning during launch on November 14, 1969 and was almost aborted. Apollo 12 repeated its predecessor's journey and demonstrated the ability to land at a preselected point on the moon. 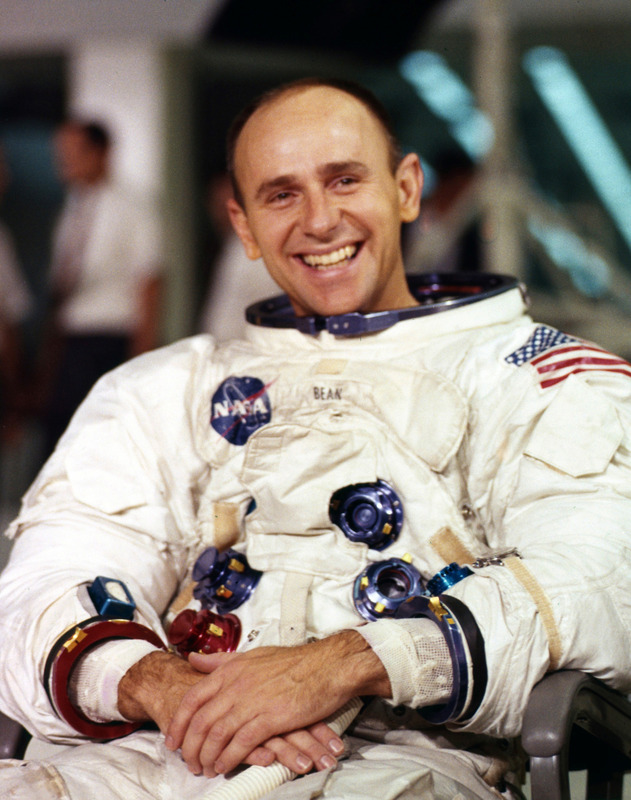 Charles Conrad, Jr., Richard F. Gordon, Jr., and Alan L. Bean (a native Texan) were the second United States crew to go to the moon; during two extravehicular activities, Conrad and Bean became the third and fourth men to walk on the lunar surface. On April 11, 1970, the Apollo 13 mission, designed to follow Apollo 11 and Apollo 12 in format, was launched. However, before the crew, consisting of Fred W. Haise, Jr., James A. Lovell, Jr., and John L. Swigert, Jr., reached the moon's orbit, a liquid oxygen tank exploded, blowing a hole in the service module. The explosion knocked out most of the command ship's cooling, oxygen, and electrical systems and made completion of the moon landing impossible. Using the lunar module as a "lifeboat," the astronauts flew around the moon and then returned safely to the earth on April 17, 1970, in their crippled command module. They landed with just fifteen minutes of power to spare. Despite the Apollo 13 failure, Apollo 14 was launched on January 31, 1971, with astronauts Alan B. Shepard, Edgar D. Mitchell—the fifth and sixth men to walk on the moon—and Stuart A. Roosa. The Apollo 14 flight coincided with the thirteenth anniversary of the American entry into the space age. On January 31, 1958, a Jupiter C rocket had put the Explorer I satellite into orbit. The anniversary was perhaps significant due to the fact that during 1971 the future of the United States program was questioned and threatened by critics. Thousands of people employed by the NASA complex and hundreds of support industries connected with the space program sought reaffirmation of United States space goals. The fourth lunar landing mission, Apollo 15, launched on July 26, 1971, completed the first Lunar Rover vehicle test, returned with lunar samples, and launched a subsatellite from lunar orbit. Apollo 16, launched April 16, 1972, spent a longer period on the lunar surface and collected 213 pounds of samples, while its command module carried out lunar mapping and other scientific tests. Apollo 17, begun on December 7, 1972, with the first night launch, carried the first scientist-astronaut, geologist Harrison Schmitt, on its crew and returned after three lunar surface excursions with unique soil samples, including orange glass beads. 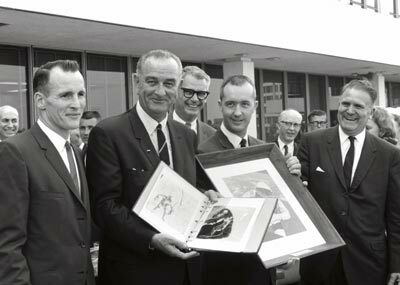 On August 17, 1973, the Manned Spacecraft Center was officially renamed the Lyndon B. Johnson Space Center. Over the succeeding years, housing developments, apartment projects, motels, and shopping centers were built on previously open prairies in the Clear Lake area, and millions of dollars and thousands of people arrived on the upper Texas coast. The Skylab program, which comprised the first United States space-station missions, made four launches beginning on May, 14, 1973, with the placement of an unmanned workshop into earth orbit by a two-stage Saturn V rocket. Skylab served as a laboratory, observation station, and home for three astronaut crews. A meteoroid shield problem that developed during the launch was solved with the design of a "solar parasol" to cover the workshop, and the first repair mission in space was carried out by the astronaut team, who remained on board for twenty-eight days. The second crew, launched on July 28, 1973, conducted observations of the earth and medical, astrophysical, and flight experiments for nearly two months in orbit. The third crew, launched on November 16, 1973, set an orbital record of more than eighty-four days and conducted extensive observation and photography of Comet Kohoutek. After more than six years in orbit, Skylab reentered the earth's atmosphere on July 11, 1979. Altogether nine Skylab astronauts spent a total of 171 days in space. 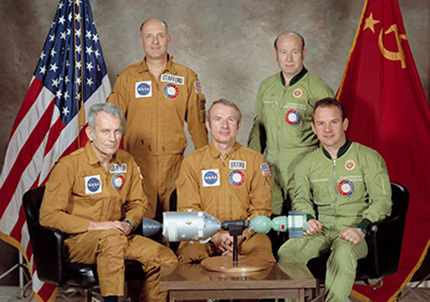 Photograph, Space crew for the Apollo-Soyuz Test Project, a cooperative venture between the United States and the former Soviet Union. Courtesy of NASA. Image available on the Internet and included in accordance with Title 17 U.S.C. Section 107. The first international space mission, the Apollo-Soyuz Test Project, began as a cooperative venture between the United States and the Soviet Union. The project tested an international docking system and joint space-flight procedures, but is remembered most for the first space handshake between crews from different nations. The Soviet Soyuz spacecraft carrying cosmonauts Alexei Leonov and Valery Kubasov and the Apollo spacecraft with astronauts Thomas P. Stafford, Vance D. Brand, and Donald K. "Deke" Slayton were launched 7½ hours apart on July 15, 1975, and docked on July 17. In addition to rendezvous, docking, crew transfer, and joint control center-crew operations, the crews gave televised tours of their spacecraft and performed joint solar eclipse experiments. Photograph, Picture of the shuttle Enterprise. Courtesy of NASA. Image available on the Internet and included in accordance with Title 17 U.S.C. Section 107. Photograph, Shuttle lift-off for the shuttle Colombia. Courtesy of Daily Mail. Image available on the Internet and included in accordance with Title 17 U.S.C. Section 107. The Columbia STS-9 Crew. Courtesy of NASA. Image available on the Internet and included in accordance with Title 17 U.S.C. Section 107. 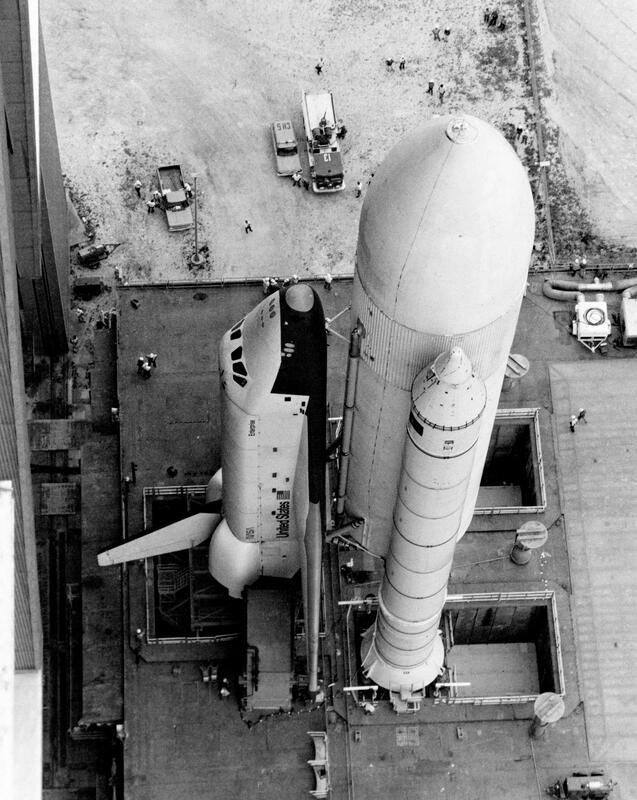 The Johnson Space Center designed, developed, produced, and tested its first shuttle, Enterprise, after the project was approved by President Richard M. Nixon on January 5, 1972. Winged space shuttles, like airplanes, could reenter from space and land on runways instead of hitting the ocean and could serve not only as launch vehicles, but as science laboratories, earth-observation outposts, and repair and retrieval stations for satellites. On April 12, 1981, the shuttle Columbia was first launched into space on a test flight carrying John W. Young and Robert L. Crippen. The launch saw many firsts for the manned-space-flight program. 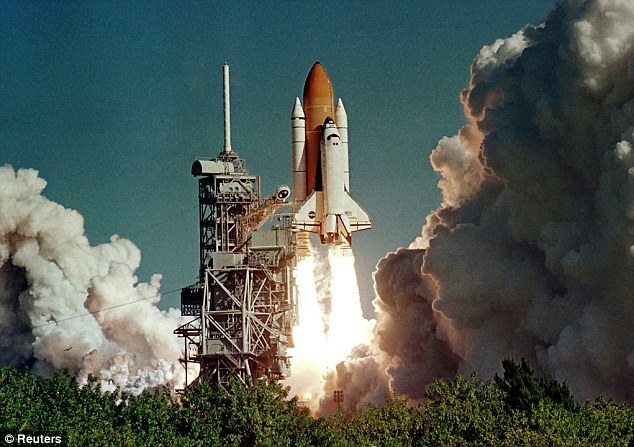 It was the first space flight of the space shuttle system and the first to use solid rocket boosters. The Columbia was also was the first orbiter that, with its three main engines, could be refurbished and reused. Columbia's second crew, launched on November 12, 1981, cut short its mission when trouble developed with one of the craft's three fuel cells. Nonetheless, the crew tested a Canadian-built remote manipulator system with a giant robotic arm designed to deploy and retrieve satellites. On April 4, 1983, Challenger set out with a four-member crew, including Donald H. Peterson and F. Story Musgrave, that completed the first shuttle spacewalk. Other orbiters, Discovery, Atlantis, and Endeavour, were added to the shuttle fleet between 1984 and 1992. The shuttle program involved not only experienced military pilots but also scientists and technical specialists from a variety of backgrounds. On June 18, 1983, mission specialist Sally K. Ride, a physicist, became the first American woman to fly in space. The third Challenger flight carried Guion S. Bluford, Jr., the first black astronaut to reach orbit, and William E. Thornton, at that time the oldest astronaut (fifty-four years old; subsequently, Vance Brand, age fifty-nine, surpassed Thornton's age on the STS-35 mission in December 1992). The STS-8 launch occurred on August 30, 1983. Bruce McCandless II moving through space in a Manned Maneuvering Unit. Courtesy of NASA. Image available on the Internet and included in accordance with Title 17 U.S.C. Section 107. Kathryn Sullivan exits the Challenger shuttle to walk in space. Courtesy of NASA. Image available on the Internet and included in accordance with Title 17 U.S.C. Section 107. The Columbia STS-9 Spacelab mission, launched on November 28, 1983, put into orbit a scientific workshop built by the European Space Agency to enable scientists and astronauts to conduct experiments in space and carried the first non-American to fly on a United States spacecraft, Ulf Merbold, a German physicist. On the STS-41B mission (February 7, 1984), astronaut Bruce McCandless II tested a Manned Maneuvering Unit backpack and became the first free-orbiting human satellite of the earth. His crewmate, Robert L. Stewart, made extravehicular repairs on satellites that led to the shuttle's ability to make "service calls" in space. The Challenger STS-41C launch of April 6, 1984, effected the first space rescue of a failed satellite, a disabled Solar Max that had been drifting for three years, which astronauts retrieved, repaired, and re-launched. The first flight to include seven crew members began on October 5, 1984. On this flight Kathryn D. Sullivan became the first American woman to walk in space. The flight included the first Canadian astronaut, Marc Garneau, and demonstrated the first in-orbit refueling to extend a satellite's life. The Discovery STS-51A mission of November 8, 1984, retrieved two disabled satellites, and Discovery's mission of April 12, 1985, included Senator E. J. "Jake" Garn (R-Utah), chairman of the Senate committee with oversight for NASA's budget, the first elected official to fly in space. House of Representatives member Bill Nelson (D-FL) flew aboard the Columbia on January 12, 1986. In 1985, missions focused on life and material-sciences experiments, and West Germany financed and operated a Spacelab mission. 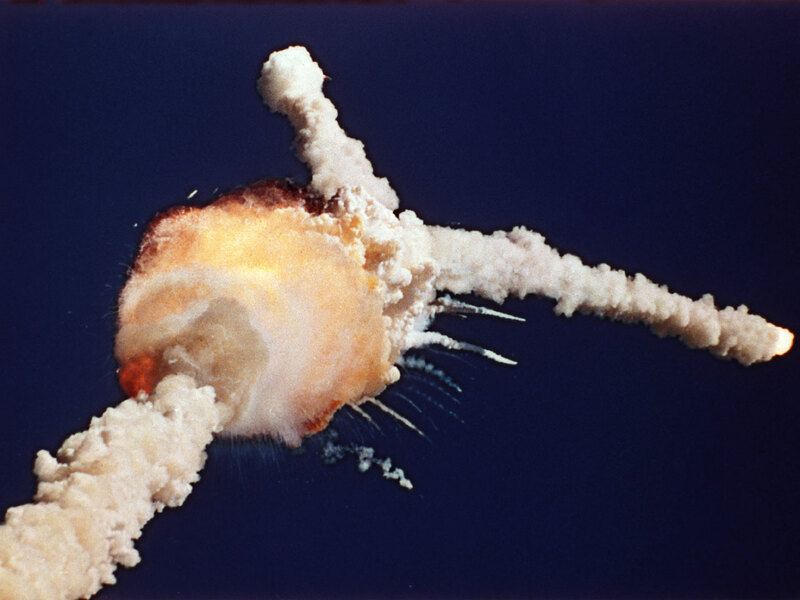 Photograph, The explosion of the Challenger in 1986. Courtesy of CBS News. Image available on the Internet and included in accordance with Title 17 U.S.C. Section 107. On January 28, 1986, a leak in a solid rocket booster seal caused the shuttle Challenger to explode shortly after liftoff. All the crew died—Francis R. Scobee, Michael J. Smith, Judith A. Resnik, Ellison Onizuka, and Ronald McNair, as well as Gregory B. Jarvis of Hughes Aircraft and S. Christa McAuliffe, a New Hampshire school teacher who was to be the first passenger-observer in the United States space program and the first "teacher-in-space." The Hubble Space Telescope is launched in April 1990. Courtesy of NASA. Image available on the Internet and included in accordance with Title 17 U.S.C. Section 107. Mae Jemison suited up before the launch of the Spacelab J mission, 1992. Courtesy of NASA. Image available on the Internet and included in accordance with Title 17 U.S.C. Section 107. Ellen Ochoa on the flight deck of space shuttle Atlantis. Courtesy of NASA. Image available on the Internet and included in accordance with Title 17 U.S.C. Section 107. After being grounded for thirty-two months, astronauts reentered space on September 29, 1988, as part of a Discovery mission, and subsequent shuttle launches carried major interplanetary and astronomical payloads. Atlantis launched the Magellan spacecraft to Venus in May 1989, and Galileo began a six-year journey to orbit Jupiter in October 1989. The Hubble Space Telescope was deployed by Discovery in April 1990, and a second Great Observatory, the Gamma Ray Observatory, was launched by Atlantis in 1991 to make images of objects at high energy wavelengths. Endeavour's maiden voyage in May 1992 demonstrated the flexibility of shuttle astronauts and ground controllers to handle real-time problems. After three unsuccessful attempts at retrieving a stranded Intelsat satellite, astronauts Pierre Thout, Rick Hieb and Tom Akers improvised the first three-man spacewalk and successfully captured the satellite by hand. The spacecraft's next voyage carried Spacelab J, the first joint United States and Japanese space-shuttle mission, with the first Japanese citizen, Mamoru Mohri, to fly on a shuttle, the first black woman in space, Mae C. Jemison, and the first married couple on a mission. By 1993, when Ellen Ochoa on Discovery became the first Hispanic woman in space, the space shuttle fleet had launched fifty-four successful missions, traveled more than 130 million statute miles, and flown 161 individuals in space, including sixteen non-United States astronauts from ten countries. President Reagan giving a speech at NASA's Dryden Flight Research Center on July 4, 1982. Courtesy of NASA. Image available on the Internet and included in accordance with Title 17 U.S.C. Section 107. A January 1984 Space Station Mock Up. Courtesy of NASA. Image available on the Internet and included in accordance with Title 17 U.S.C. Section 107. Photograph, Picture of the International Space Station. Image available on the Internet and included in accordance with Title 17 U.S.C. Section 107. The space shuttle Atlantis docked on Russia's Mir space station, 1995. Courtesy of NASA. Image available on the Internet and included in accordance with Title 17 U.S.C. Section 107. In 1984 President Ronald Reagan committed the nation to develop a permanently staffed space station within a decade, and in September 1988 a formal international agreement was reached among Japan, Canada, and ten European Space Agency members to participate in the Space Station Freedom program. Space Station Freedom experienced several budget cuts, cost overruns, delays, and redesigns in the ensuing years, and funding for the entire program was nearly discontinued by Congress in 1993. To achieve cost savings, President William J. Clinton ordered the station redesigned and management streamlined. Johnson Space Center became the host center for the new Space Station Program Office, and Boeing Defense and Space Group was selected as the single prime contractor. The end of the Cold War also presented new opportunities for the project to evolve. From 1991 to 1993, a series of cooperative agreements were reached for joint United States-Russian space activities, including Russian participation in the building of the proposed space station. As a result, plans for Space Station Freedom, which included modules built by the U.S., Japan, and the European Space Agency, were combined with Russian plans for their Mir-2 space station to create the framework for a new international venture. The original partner agencies of Space Station Freedom signed off on the invitation to Russia, and a renegotiated agreement was eventually reached on January 29, 1998, to establish the International Space Station (ISS) program. The first two pieces of the ISS, Unity and Zarya, are mated in December 1998. Courtesy of NASA. Image available on the Internet and included in accordance with Title 17 U.S.C. Section 107. The renewed sense of cooperation between Cold War-era foes also resulted in the establishment of the U.S.-Russia Programs Office at the Johnson Space Center in 1992. To build the collaborative groundwork necessary for the future construction and operation of the ISS, the center initiated the joint Shuttle—Mir program, which ran from 1994 to 1998. During the program, eleven space shuttle flights were conducted, and American astronauts spent seven long-term residencies aboard Mir. In the process, American astronauts gained invaluable experience in multi-national crew and cargo exchanges, long-duration space flights, and space station module assembly. Collaborative scientific experimentation aboard Mir and ongoing preparations for the construction of the International Space Station also shifted focus away from the Spacelab program, which was gradually phased out. Despite serious concerns about safety issues aboard Mir, including a fire and accidental collision with a Russian resupply craft in 1997, the Shuttle—Mir program was largely considered a success. After fifteen years in orbit, Mir was deorbited in 2001. The Crew of Expedition One pictured during training in May 2000. Courtesy of NASA. Image available on the Internet and included in accordance with Title 17 U.S.C. Section 107. 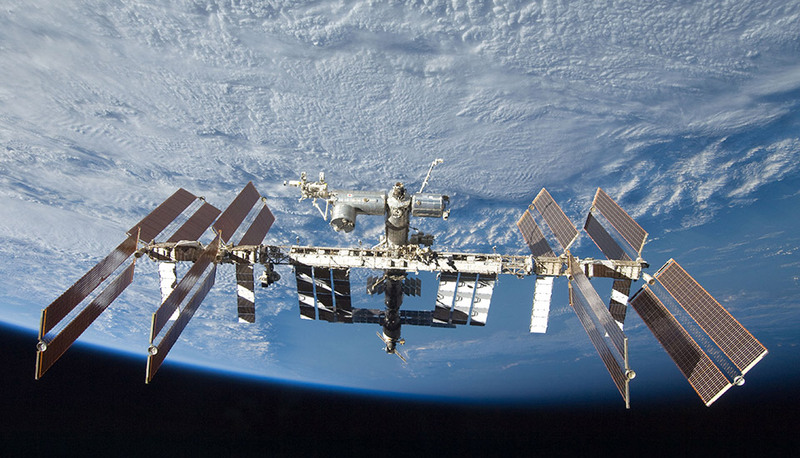 Assembly of the ISS began in November 1998, with the launch of the Russian Zarya module. A NASA shuttle mission, STS-88, arrived two weeks later to connect the U.S.-built Unity module to Zarya. A third module, the Russian-built Zvezda, was added in July 2000 and the first crew, Expedition 1, arrived in November 2000, beginning an uninterrupted human presence aboard the station that continues as of March 2017. Construction of the ISS was eventually completed in 2011. In total, the project required 161 spacewalks and over 1,000 hours of assembly time. Upon completion, the ISS covered the length of a football field, amassed more than 390 metric tons, and provided more livable space than a conventional five-bedroom home, with two bathrooms, a gymnasium, and ample space for crews to conduct research experiments. As of October 2015, the station had hosted 220 visitors and spacecraft from four different countries, with plans to continue operation until at least 2020. The Neutral Buoyancy Laboratory. Courtesy of NASA. Image available on the Internet and included in accordance with Title 17 U.S.C. Section 107. X-38 Crew Return Vehicle drops away from an Air Force plane, 1999. Courtesy of NASA. Image available on the Internet and included in accordance with Title 17 U.S.C. Section 107. The Shuttle—Mir and ISS programs also necessitated a significant overhaul and improvement of the training and research facilities at the Johnson Space Center. In 1995, construction began on the Neutral Buoyancy Laboratory, a 6.2 million gallon pool capable of accommodating full-scale mock-ups of ISS modules. The new facility allowed for crews to practice the various tasks necessary for ISS assembly in a simulated weightless environment. Also in 1995, construction began on an addition to the center's historic Mission Control Center, with updated technology and new flight control rooms outfitted to oversee all aspects of space station operations. Johnson Space Center engineers also designed and developed a number of new technologies geared toward ISS construction and operation, including the Simplified Aid for EVA Rescue (SAFER) propulsion system and the X-38 Crew Return Vehicle (discontinued in 2002). The Crew of STS-107 on space shuttle Columbia in 2003. Courtesy of NASA. Image available on the Internet and included in accordance with Title 17 U.S.C. Section 107. The Orion Multi-Purpose Crew Vehicle being assembled, 2011. Courtesy of NASA. Image available on the Internet and included in accordance with Title 17 U.S.C. Section 107. On February 3, 2003, the shuttle Columbia disintegrated during reentry (see SPACE SHUTTLE COLUMBIA CRASH). Tragically, all seven crews members—Rick D. Husband, William C. McCool, Michael P. Anderson, Ilan Ramon, Kalpana Chawla, David M. Brown, and Laurel Blair Salton Clark—were killed, and space shuttle flight operations were grounded for more than two years. After a six month investigation it was determined that a piece of foam insulation, shed from one of the shuttle's external tanks during launch, had damaged the orbiter's left wing. In the wake of the disaster, President George W. Bush announced his "Vision for Space Exploration" in January 2004. The plan called for the completion of the ISS, the development of a replacement for the aging shuttle program, and a return to the moon by 2020, with the eventual goal of sending a manned mission to Mars. To accomplish this, NASA initiated the Constellation program in 2005, with the Johnson Space Center again acting as the lead center. The Obama Family is shown the space shuttle Atlantis at the Kennedy Space Center on April 29, 2011. Courtesy of NASA. Image available on the Internet and included in accordance with Title 17 U.S.C. Section 107. The SpaceX Dragon commercial cargo craft is grappled by the Canadarm 2 at the ISS. Courtesy of NASA. Image available on the Internet and included in accordance with Title 17 U.S.C. Section 107. The center's primary contribution to the Constellation program was the design and development of the Crew Exploration Vehicle (now known as the Orion Multi-Purpose Crew Vehicle), an Apollo-like spacecraft designed to carry an enlarged crew beyond low-Earth orbit and into deep space. Johnson Space Center engineers also began developing new robotics technologies, conceptual designs for a new lunar lander, and research into the effects of long-duration, deep-space flight on human crew members. However, Constellation was discontinued in 2010 after President Barack Obama announced a policy shift that emphasized the development of commercial manned space flight. As a result of the new policy, the shuttle program officially ended with the safe return of the shuttle Atlantis on July 11, 2011, and with no immediate plans for a government-funded shuttle replacement. The end of the shuttle and Constellation programs, coupled with sustained budget cuts, lead to substantial downsizing of the center's workforce, as well as the demolition and consolidation of some of the on-site facilities. Subsequently, the center pivoted towards the development of strategic partnerships with emerging technology companies. Although the center continues its work on the development of the Orion Multi-Purpose Crew Vehicle, the operation of the International Space Station, and research into the possibilities of human deep-space travel, it also serves a pivotal role in coordinating with private companies such as SpaceX and Orbital ATK to engineer the next generation of space transportation. This work resulted in the first successful resupply mission to the ISS by a privately-developed spacecraft, the SpaceX Dragon, in October 2012. Photograph, Picture of an exhibit outside Space Center Houston. Image available on the Internet and included in accordance with Title 17 U.S.C. Section 107. The Space Center Houston visitor center, designed with the help of Walt Disney Imagineering, opened in 1992. Visitors can tour Mission Control and astronaut-training facilities at the Johnson Space Center, view historical spacecraft and displays, watch several movies including IMAX and 4K film shot in space, and explore a museum of the American space program. Space Center Houston is owned and operated by the nonprofit Manned Space Flight Education Foundation, Incorporated. No NASA funds were used for the visitor center construction or operations. 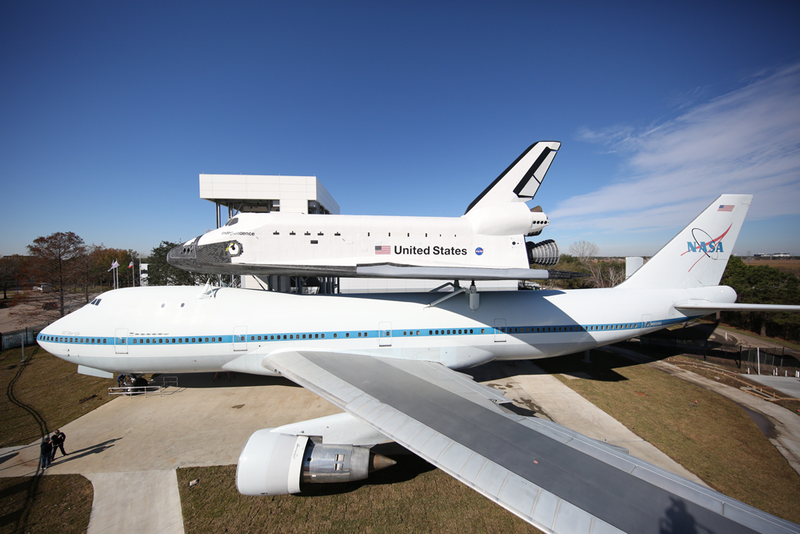 In 2014 Space Center Houston became the first Smithsonian-affiliate museum in the city of Houston. In 2016 the visitor center opened Independence Plaza, an exhibit complex allowing visitors to access Independence, a full-scale replica of the space shuttle. That same year, the center hosted nearly one million visitors, and engaged in outreach and educational programs involving more than 100,000 students and educators. See also AEROSPACE MEDICINE, LYNDON B. JOHNSON SPACE CENTER. Valentine J. Belfiglio, Go for Orbit: A Visit to the Lyndon B. Johnson Space Center (Austin: Eakin Press, 1987). Henry Dethloff, Suddenly Tomorrow Came: A History of the Johnson Space Center (NASA History Series SP-4307, 1993). James M. Grimwood, Project Mercury: A Chronology (NASA SP-4001, 1963). Houston Post, July 16, 1969, January 31, 1971. NASA Facts Series, Office of Public Affairs, Johnson Space Center. NASA Mission Reports, NASA Office of Public Affairs. New York Times, October 11, 1968. Stephen B. Oates, "NASA's Manned Spacecraft Center at Houston, Texas," Southwestern Historical Quarterly 67 (January 1964). Loyd S. Swenson, Jr., "The Fertile Crescent: The South's Role in the National Space Program," Southwestern Historical Quarterly 71 (January 1968). L. S. Swenson, Jr., J. A. Grimwood, and C. C. Alexander, This New Ocean: A History of Project Mercury (NASA SP-4201, Washington, 1966). 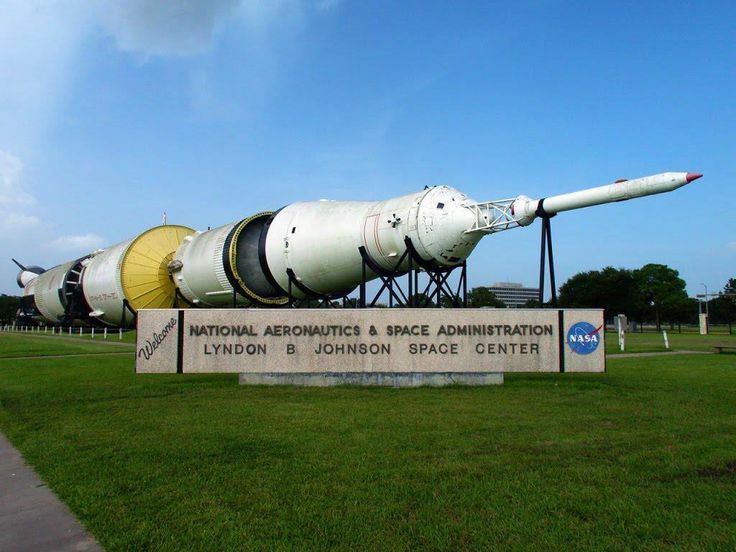 Handbook of Texas Online, Charles C. Alexander and Diana J. Kleiner, "LYNDON B. JOHNSON SPACE CENTER," accessed April 22, 2019, http://www.tshaonline.org/handbook/online/articles/sql01.